This is a post I wrote a few years back. It’s actually kind of astounding how important this is to remember. Dear children, of all the wisdom imparted on me by your father, one of his greatest lessons was that there are such people as vampires. Oh, now, don’t be all silly- as much fun as it might be to imagine moldering old French vampires preying on the criminals of New Orleans, or as shallow and vapid as those sparkly versions that came later might be- that’s simply misdirection. The vampires you must be careful of- the vampires that are not fun to imagine but who do exist and can actually harm you are Spiritual Vampires. 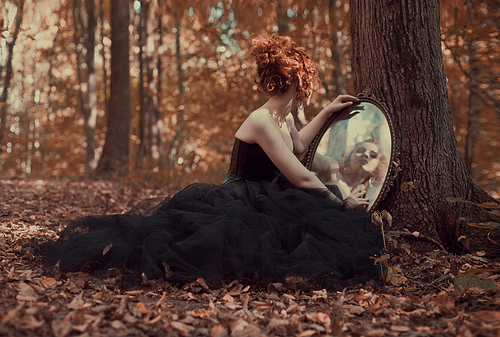 Common folklore tells that a vampire cannot see their reflection in a mirror. Spiritual Vampires cannot see their own reflection in anything. A Spiritual Vampire cannot see how they effect others or what repercussions their actions have on other lives and souls. Even more damning, they refuse to see or acknowledge their part in anything that happens in their lives. Everything— everything— is the fault of someone else. It doesn’t matter how many loving people try and give them genuine feedback, try and guide them, plead with them, hold up mirrors (if you will) for them to see themselves accurately, it doesn’t work. The Spiritual Vampire cannot see themselves except from their own side. Just like a French Vampire or a sparkly one (if you insist. sigh) these vampires prey on the weak or those who wish to please. It’s in their interest to keep people naive to their natures, and they will obfuscate and manipulate and deceive, and the part that makes them so (very, very) dangerous is that they believe their own lies. When prey ceases to surrender to the narrative of the vampire, when the mark starts to question the story, or look askance, the vampire must slander or excise that person from their lives, lest the fear of being discovered- or worse, having to look at themselves. This must be avoided at all costs. All roads lead to their own control. A person who actually sees the Spiritual Vampire is a great threat to their perceived well-being. These folks burn through friends. Or at least, what they call ‘friends’. It’s impossible to cultivate a real friendship with a vampire, because they cannot let go of their control, or of their insatiable thirst for validation of their own rightness of position. It’s not blood they need to survive, but undying loyalty to their rigid beliefs. Do remember, the weight of their own construct is crippling. Have pitty. But don’t get too close. If you find yourself engaged with a Spiritual Vampire, your life actually can be in danger— no, you won’t be exsanguinated— but your energy, your identity, your will to power, your individuality, your unique opinions and sense of self will all be expected to be sacrificed upon their altar to support their construct and beliefs. And all that you have to offer will never be enough. In fighting this kind of vampire, just as in the models of yore, sunlight is your best weapon. Fling open the windows, invite in fresh air, speak what you know as your own truth, and never be sucked into the idea that you are responsible for anyone else’s self worth. Never let anyone convince you that they are the arbiter of yours, either. Treat people with love, kindness and honesty, take responsibility for your own actions, don’t manipulate, control or blame others. Stand in the sunlight. If anyone tries to tell you that you owe them more… get out your mirrors. Or…just get out. I believe I read this years ago before I’d ever met you! It’s even better this time around. And so true. My mom’s best friend used to say, “The problem with manipulative people is that they’re always trying to manipulate you. So the only way you can actually deal with them is by not interacting with them at all.” It was what gave me the courage to cut my ex-boyfriend out of my life and to keep him out even after I was married and he kept trying to worm his way back in! My Mom’s friend, and myself, are all huge Buffy fans, too. So there’s also that!